Kastar Mini Rapid A/C Charger Features a Fold-out US Plug, 110-240V Worldwide Input Voltage, Car Charging Adapter, and European Plug. 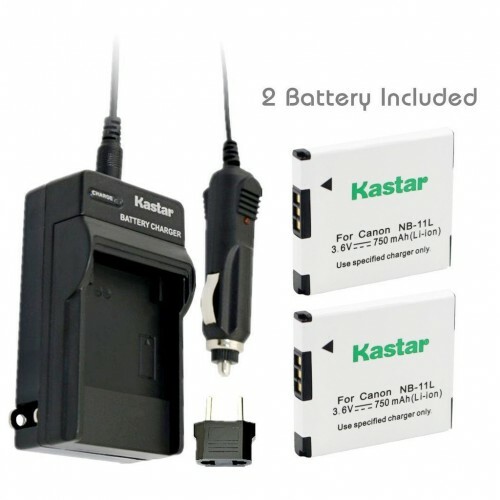 Kastar Battery Utra-high Capacity. Use high quality Japanese Cells for longer battery life with no Memory Effect. Charge indication Green lights for standby, Red is for charging and with automatic constant current control prevents battery from overcharging, short circuit, and electronic shock. 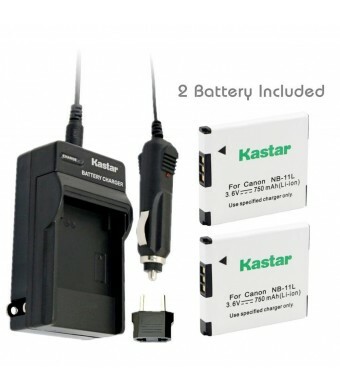 All Items 100% decoded and 100% Compatible with the Original Camera, Battery, and Power Accessories. All Items Include 30-day Money Back and 3-YEAR Manufacturer Warranty. Canon A2400 IS Canon A2500 Canon A2600 Canon A3400 IS Canon A3500 IS Canon A4000 IS Canon ELPH 110 HS Canon ELPH 115 HS Canon ELPH 130 HS Canon ELPH 135 HS Canon ELPH 140 HS Canon ELPH 150 HS Canon ELPH 320 HS Canon ELPH 340 HS Canon SX400 IS Canon IXUS 132 Canon IXUS 140? Canon IXUS 145? Canon IXUS 150? Canon IXUS 155? Canon IXUS 265 HS?